Khash language is spoken in Sarsi-Daryan Village located in the District Doda of Jammu and Kashmir State of India. The Village is 40 kms away from the main Doda city of Jammu and Kashmir State. The population of Sarsi village is around 1100, out of which 700-750 people are Muslims and the rest 350-400 are Hindus. The Village is known not only for its cultural heritage and ethnic values, but also for its secularism and religious tolerance.The languages spoken in Sarsi village panchayats are mostly Kashmiri, which is spoken by Muslims and Khash, which is spoken by Hindus also. Khash language is one of the members of the Indo-Aryan language family. As the speakers of Khash language are less than 500, it is considered to be one of the endangered languages in India. Although some Muslims can also speak Khash, but it is not their native language. Other than Kashmiri and Khash, the people of Sarsi village know Urdu and Hindi. Urdu is the lingua-franca of the area. Khash language has no script and is not taught in any of the local schools. There is no available literature in Khash language, but the language is rich in oral tradition, folk songs and folklore. No linguistic research or documentation of this language has been done till date. It remains unexplored as far as the linguistic description of the language is concerned. 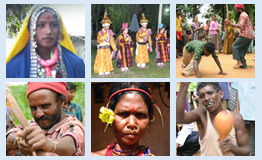 The people of the Khash community belong to Hinduism. They worship gods and goddesses of the Hindu religion. The main concept regarding the substantive belief revolves around the faith in Kul Devta (a name assigned to Lord Shiva) and Kul Devi (Khol). While worshipping Lord Shiva is almost a common practice in Hinduism, Khash people differ from other Hindus in worshipping Khol as their Kul Devi. The main and grand ritual called Yag popularly known as Khadal (kʰaɖaːl) in Khash community of Sarsi-Daryan is performed during night to please Lord Shiva. In this ritual the devotees mainly worship the Shivlinga in order to praise and thank the god. Agriculture is the main occupation of Khash people. The major crops grown by the Khash people are maize and rice. There are other occupations like wood cutting, cattle grazing, etc, mostly done by the male folk of the community. At present the documentation and description of the language is going on. It includes providing a brief grammatical sketch of the language and compilation of the pictorial dictionary of the language. The work to document the ethno linguistic profile of the community is undergoing with domains like stories, narratives, folklore, transportation, games and entertainment, religion and rituals, social customs and communicative behavior yet to be completed. The documentation of various aspects of Khash language and community is being done in audio and video form.